November 18, 2018, 11:53 AM · At the core of my teaching philosophy is that children learning an instrument should be introduced to playing with others at the earliest possible opportunity. I am a violin teacher so my experience has more often than not been with violin groups. However this pretty much applies to any instrument. The benefits of ensemble playing are huge, not just from a musical perspective, but also from a social one. Playing in a group also helps children who want to perform but are scared to do so. The group allows them to make music and enjoy the thrill of performing for others while taking away the pressure linked to performance anxiety as well as the fear of being judged and found lacking. With the right guidance from the teacher running the group, any atmosphere of competition is removed from the equation and what is left is a purely positive and joyful experience. All members of the group want it to sound good and will work together to make that happen. It doesn’t even have to be a large group or a full blown orchestra. Starting small with simple duets can be an excellent way to introduce the concept of ensemble playing. Any situation which allows children to play with others will stimulate and encourage them while helping them understand how music fits together and how one part can complement the other. It always reminds me of the Aristotelian principle; we are greater than the sum of our parts. While it is more usual when teaching to form a homogeneous group of players roughly at the same level, a mixed level group of students can also be very rewarding and beneficial. 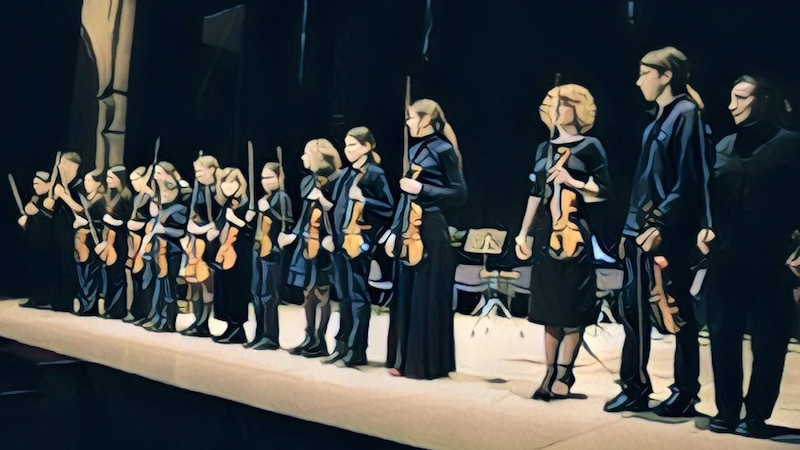 My violin orchestra, which I founded and ran in Italy, was made up of all the violin pupils that I taught and they were a really mixed bunch. I called my group the Divertimento Academy. The word “divertimento” literally means “fun” in Italian, so the concept of the Divertimento Academy was learning while having fun. As the years progressed it became even more diverse. There were some pupils who were quite advanced, others who were more of an intermediate level, some late beginners and then there were the absolute beginners who I introduced to the group as soon as possible. If I felt they had not yet mastered a straight bow, I would introduce them anyway and write a part for them that required pizzicato open strings. When introducing a complete beginner to ensemble playing it is very important, I feel, to give them a part that is really very simple. This frees them up to take in what is happening around them, to listen, feel the flow of the music and understand how their part fits in to the greater whole. This is how they will develop their understanding of music without putting their technical development at risk. It also gives them a great sense of achievement when they hear how their simple part contributes to something that sounds so lovely (again reminding us of the Aristotelian principle).They will also learn a lot subliminally from playing with more advanced players. The more advanced players can also learn a lot from playing with the beginners. They quickly become role models and mentors. They learn patience and how to help the little ones out, in this way understanding the learning process from a different perspective. In my experience it promotes a sense of camaraderie within the group and a non competitive atmosphere which is very beneficial to music making. So, be it duets, trios or something far grander, let’s make music together from the very beginning, opening a door onto a world of music making that makes the solitary practise sessions seem so much more worthwhile. November 19, 2018 at 03:35 PM · I fully agree with the premise and I love this article. I think playing with others is one of the greatest joys of playing an instrument! Coming from the perspective of an adult student, I'd like to broaden the definition of and expectations for beginners. Beginners aren't always "little ones." Sometimes they are teens or adults who also benefit from welcome, patience, and mentoring! November 19, 2018 at 03:47 PM · Dear Karen, I couldn't agree more. I have had quite a few adult beginners and they joined the orchestra with the same spirit and enthusiasm as the children as well as reaping the same benefits and enjoyment. In fact, sometimes adult beginners can be a real joy to teach... And because of their more mature perspective are often happy to practise scales, which is a plus. November 19, 2018 at 08:53 PM · My childhood violin teacher was not a very good teacher in many ways, but in this respect he was good. He didn't have a Saturday violin class, but he played duets with me at a lot of my lessons. He would assign a movement (e.g., Pleyel or Mazas) and I would work on my part for a week and then we would play it together. Then I would have to sight-read the next movement, etc. When I was 12 he brought me into a community symphony at the back of the first violins, and I learned a great deal there, partly because my stand partner was one of his other students, a girl my age who was very serious and also a little more skilled. Whether ensemble playing is rewarding or not -- especially with larger ensembles (orchestras, etc.) -- depends on the skill and musicianship of the director. I've experienced both good and bad. My expectation is not only enjoyment but I want to learn and to improve. I can deal with people around me who are not interested in that, but I can't deal with a conductor who's just mailing it in. I agree. As an adult who started over 40 years ago and my teacher used Doflein it was duets at every lesson. Starting at age 30, despite understanding the concept of playing different notes, I learned that it isn't easy, but it is fun - really fun when you get the harmonies and rhythms correct. My only problem with a lot of instruction for children is that the focus is on playing in unison (or Unisom - which happens to be the name of a sleep aid). I've had few students who had some school based training in unison based playing and the minute they hit Doflein and the teacher is playing something different - it's a speed-bump that we get over. I also have my more advanced students play with the beginners. The Doflein's, Eric and Emma developed this idea in the early 1900's. Trivia: It was the Doflein school that commissioned Bartok's duets and they had to get him to make them easier-and-easier hence the Bartok duet #1 is the most difficult in the set. November 20, 2018 at 10:14 PM · hi George, It's good to hear your experience. My own teaching is based very much around duets for the very reasons you mention. It helps the student with rhythm, intonation, general musicianship and so much more. not to mention that lessons are so much more fun for both student and teacher. November 20, 2018 at 11:56 PM · I really enjoy playing duets with my students, whether they are actual duets or just accompaniments to their pieces. I feel it's one way I can communicate with them without using any words. We occasionally still play together but his high school orchestra has a good chamber music program. So now he has more people his own age to play with who are at the same level, and he prefers that. November 21, 2018 at 09:04 AM · That is great! I am just sad a little bit that I don't have an opportunity to play with such an orchestra in my city. I am adult beginner (violin, not music) and I know I will enjoy it!